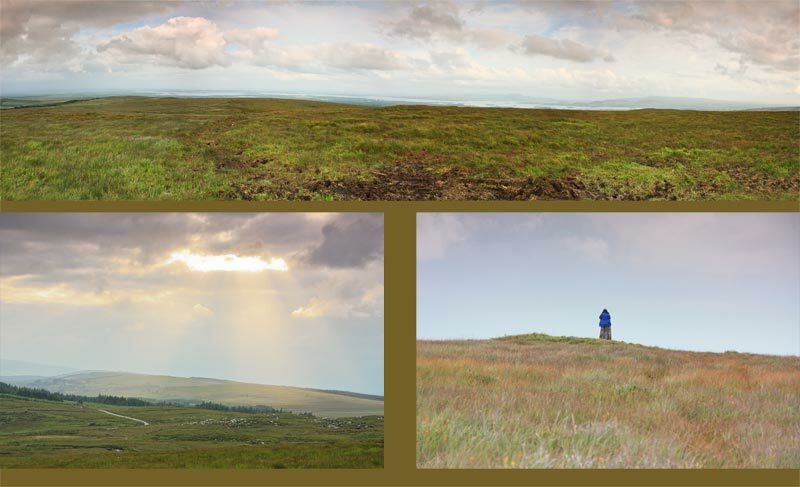 Picture from simon3 : Derg Panorama, sunburst and bog colour. Picture: Derg Panorama, sunburst and bog colour. Far vistas reward, wild bog abounds. Cappaghabaun Mountain East, CME, has an interesting distant view but its flatness makes for boggy near ground at the top. There's a few places in Ireland while not surrounded by water nevertheless have water in much of the panorama. Teevenabinnia in the Mweelrea Mountains is surrounded by an arc of Killary Fjord. CME has a 140 degree of the Shannon, in particular Lough Derg. Like acorn we could see the summits on the other side such as Tountinna. TV masts were visible on Keeper Hill and Maghera. You might wonder about "Cappaghabaun" as opposed to CME. The situation appears to be that the long partially wooded ridge extending SW from CME is Cappaghabaun and it rises no higher than about 340m. Lacking prominence it is not included in MountainViews lists. Other commentators arrived at the summit from the south via Mountshannon. This would be the quickest route certainly but, as of 2014, it is also possible in an ordinary car to slowly get to the start from the north and west. For example you can drive, somewhat circuitously from Cashlaundrumlahan to near CME. If you do so you will sample some of the unique but uncelebrated landscape of the Slieve Aughtys, too high for much conventional agriculture, too low to have spectacular peaks, covered in trees and lonely roads.